Louisiana Irises from "Down Under"
Louisiana irises got their name from the state of Louisiana, but they are grown around the world. 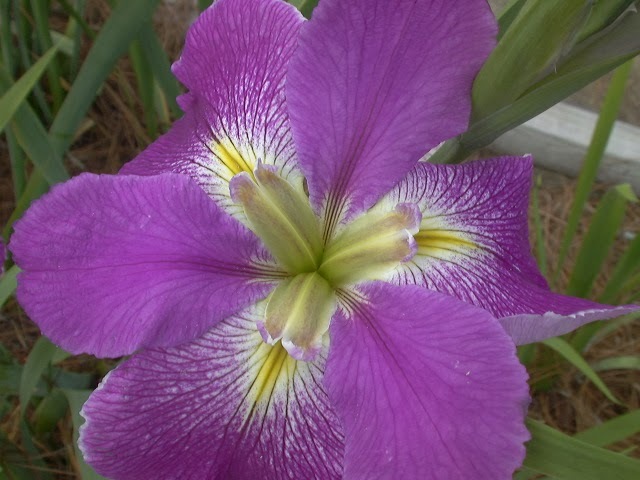 The Society for Louisiana Irises has members in many nations outside the United States. 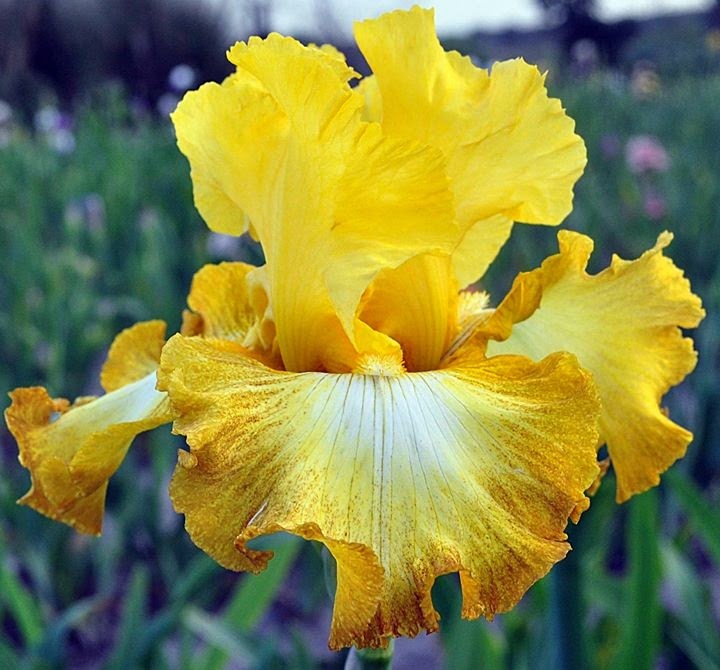 Louisiana iris hybridizers living "down under" in Australia have produced, registered and introduced many award-winning Louisiana irises. 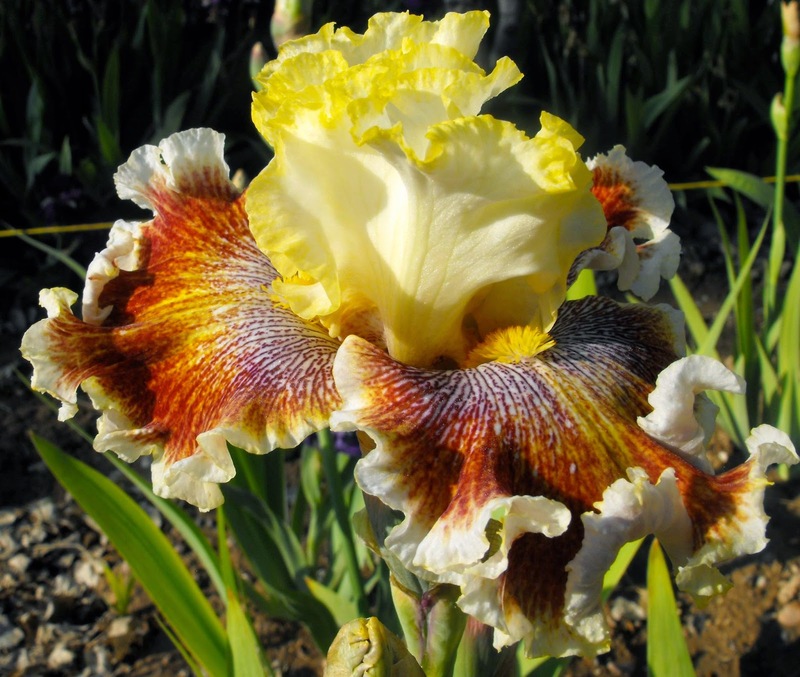 We are fortunate here at the AIS World of Irises to have Heather Pryor, a hybridizer of award-winning LA irises, join our team of bloggers. Be on the lookout for posts by Heather coming your way soon. 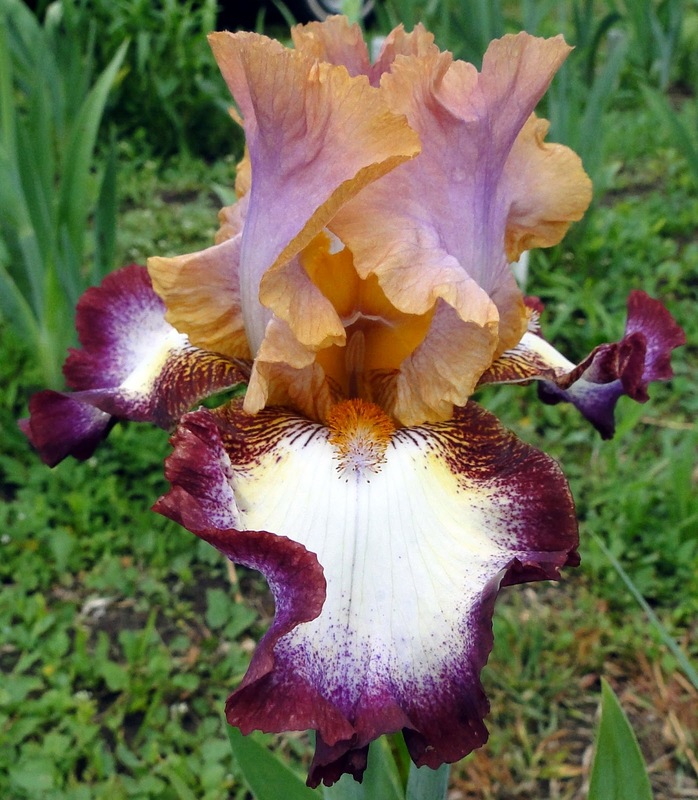 In her honor, we feature the iris that carries her name, by another Australian hybridizer, John C. Taylor. John was born in Sydney on the 4th of July. 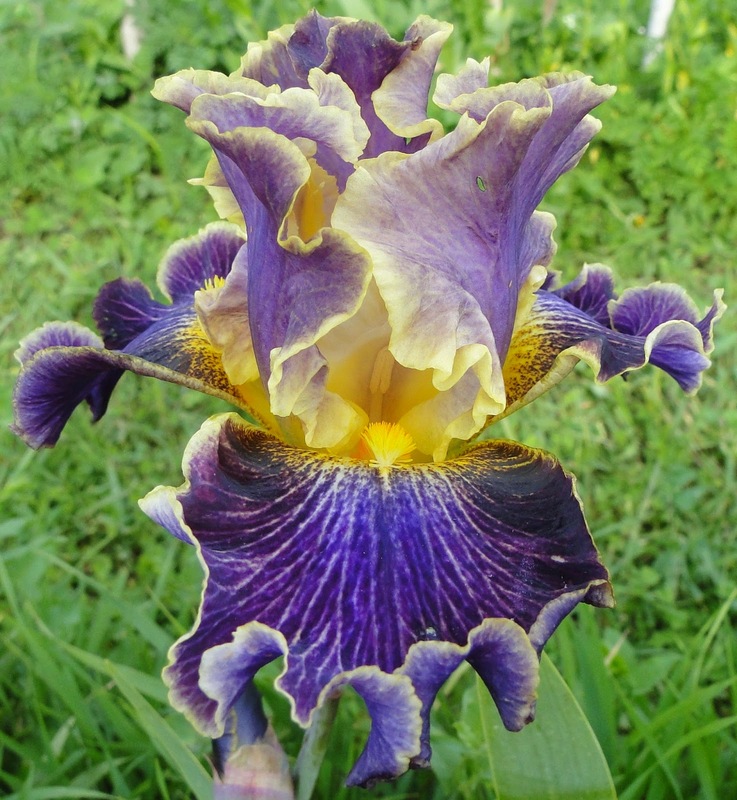 As an adult he became interested in growing irises and perhaps his birthday on the United State's independence day led to his interest in Louisiana irises. 'Heather Pryor' is one of my favorite irises. The coloring, the serrated edges, the light yellow style arms -- it just has so much beauty. I have this iris growing in many different locations and it does well wherever I plant it. It is a great garden iris and will give great increase year after year. It produces many blooms on each stalk. This is not the normal form of the flower but was probably freshly opened. This form (falls falling and stands standing) is one of my favorite flower forms but is not the most common form for this iris. I would say this represents the most common form for this iris. It has creamy stands that are flushed with a pink coloring and yellow style arms. The falls are registered as "cream ground, veined and heavily flushed pink toward paler rim" but I think of them as more pinkish with darker pink veining. 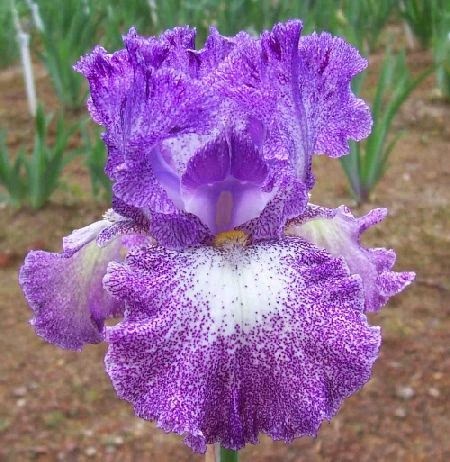 Any way you describe it, it is a lovely iris! 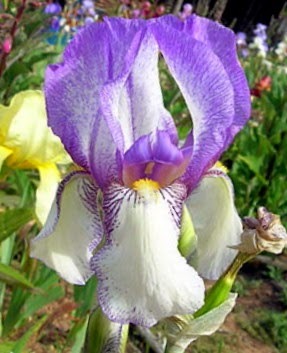 Other important irises introduced by John include 'C'est Si Bon' and 'Dural White Butterfly'. C'est Si Bon means "it is so good," an appropriate name for this iris. It remains one of my favorite irises and the white spray pattern around the signal makes it easy to spot from a distance. 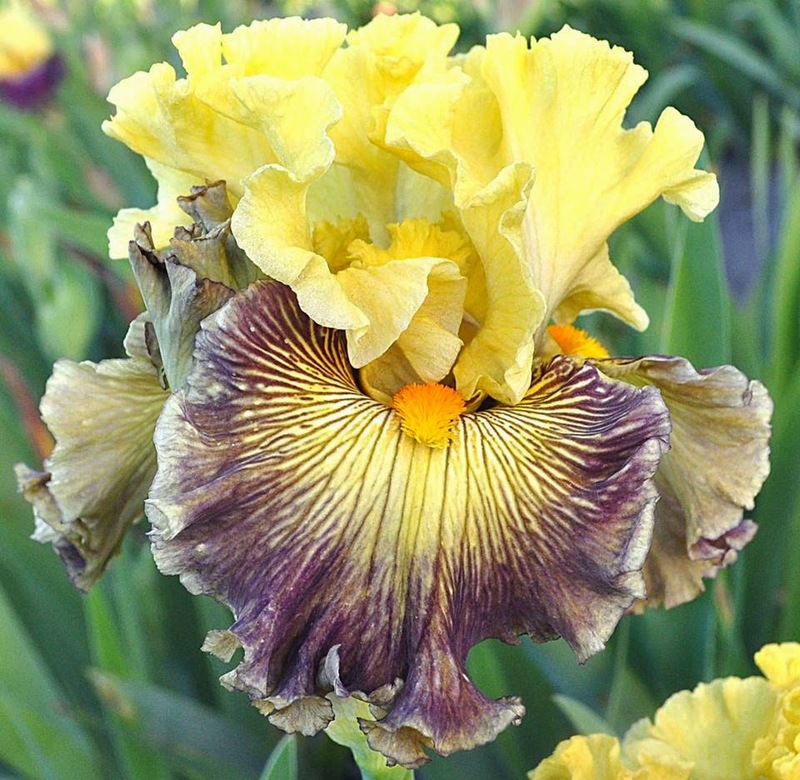 John has registered almost 200 Louisiana irises and they have won awards in the United States as well as in Australia. A number of John's irises begin with the word Dural, which is a semi-rural suburb of Sydney, in the state of New South Wales. 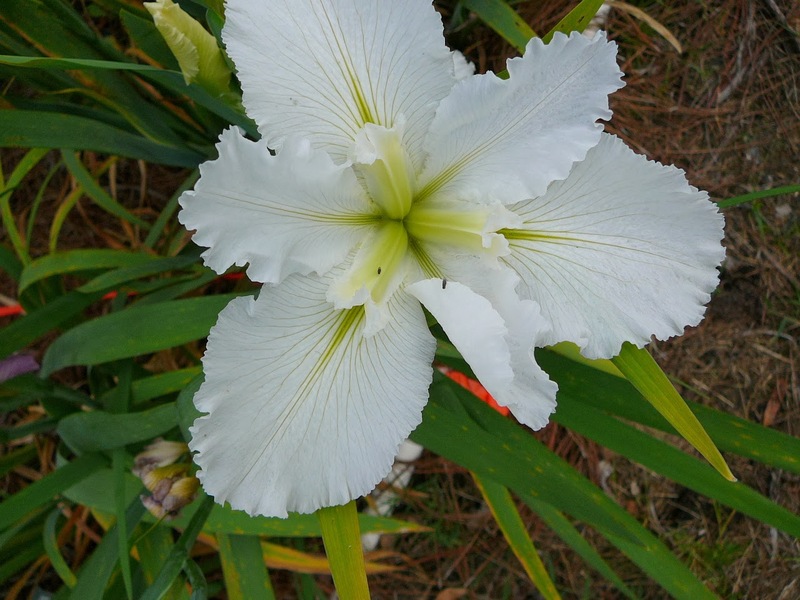 'Dural White Butterfly' is one of the most outstanding white Louisiana irises and remains very popular even with today's more modern hybrids. 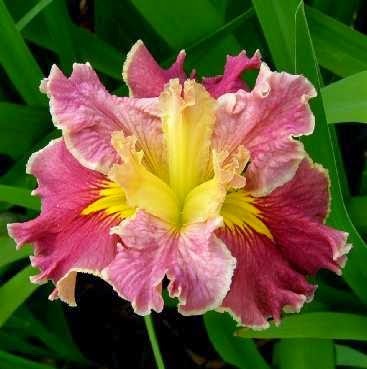 It seems to have never won an award in the US but you will find it in many many gardens and in the genealogy of many other Louisiana irises. 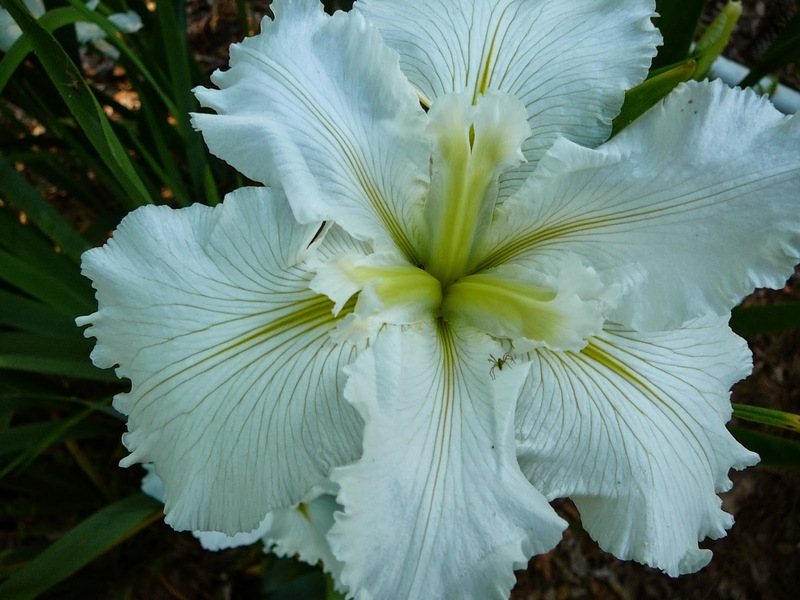 Registered simply as "white self", this wonderful iris is certainly deserving a more vivid description! 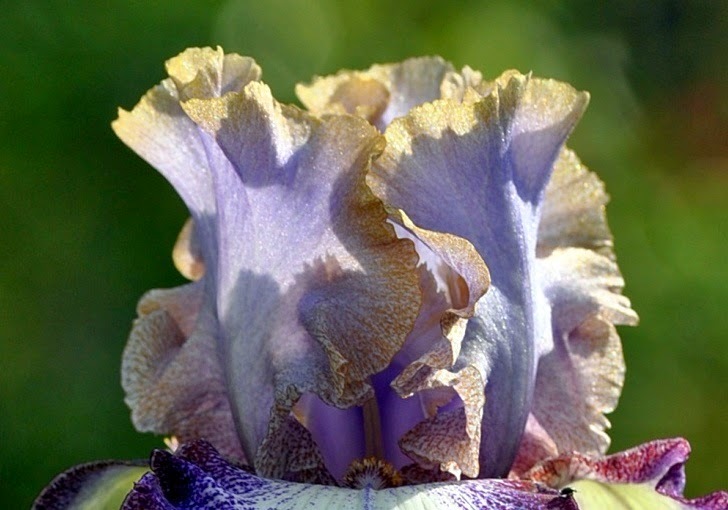 It has serrated edges and ruffling, something not common in registered irises from the 1980's. 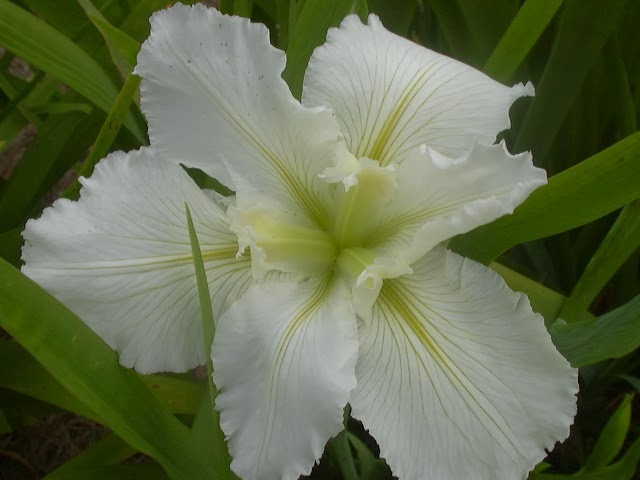 The lovely green style arms and the green veined signals certainly help to make this a distinctive white Louisiana irises. 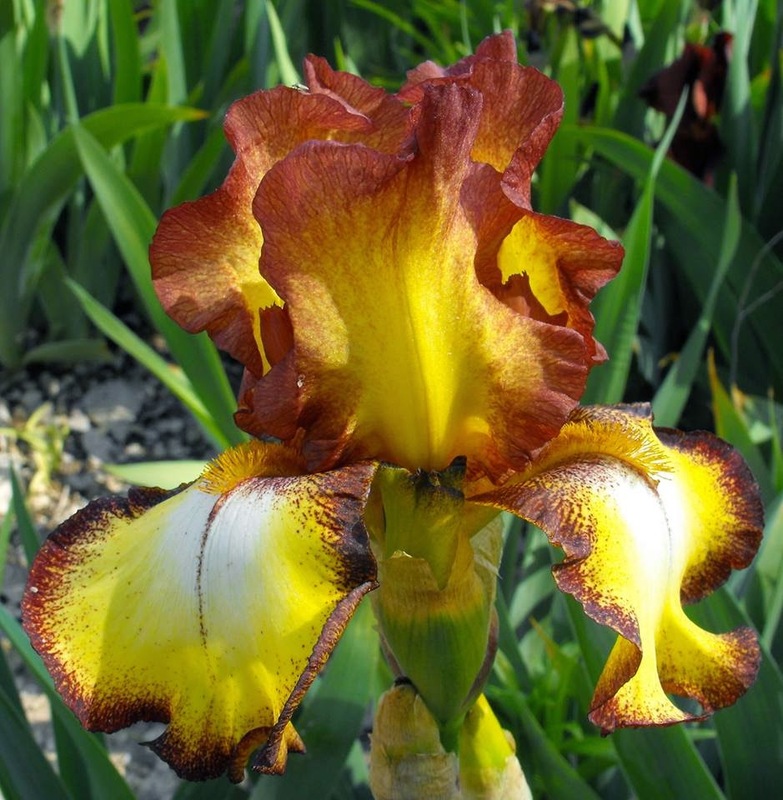 To learn more about irises in general, visit the American Iris Society. 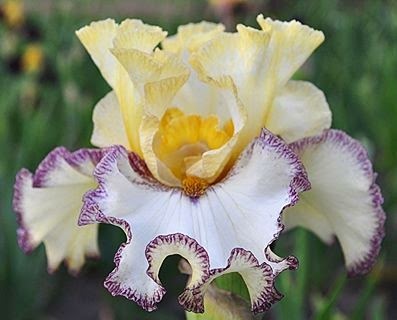 To learn more about Louisiana irises please visit the Society for Louisiana Irises. You can see more irises from "down under" by visiting Iris Haven, the gardens of Heather and Bernard Pryor at Iris Haven. 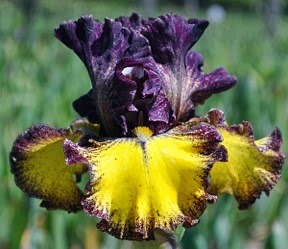 I am always interested in the names that hybridisers choose for their iris cultivar seedlings. Many of these names can tell you a lot about the hybridiser - his or her likes and dislikes - or their sense of humour and interests. 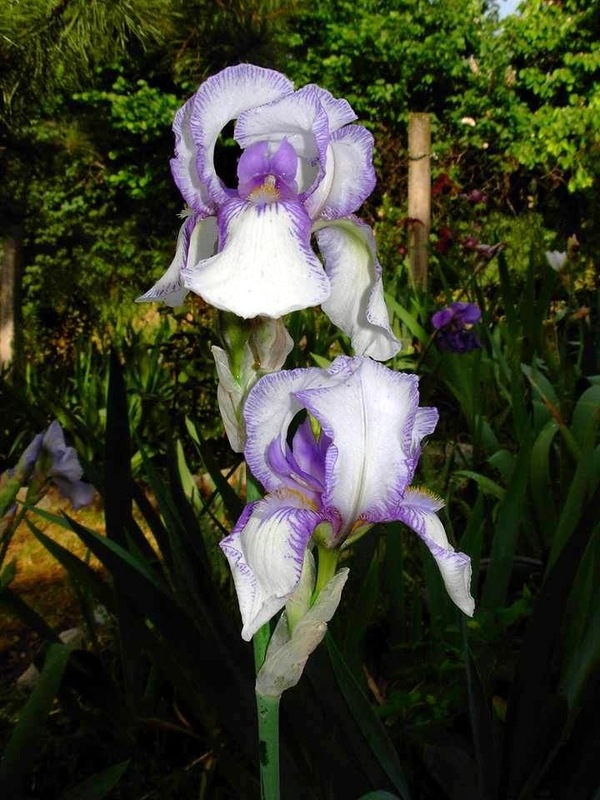 For example, in 2012 Bernard (my husband and fellow hybridizer) and I were asked by The Royal Horticultural Society of New South Wales Inc. to name one of our Louisiana iris seedlings for the 150th anniversary of the Society. The RHS of NSW was the first horticultural Society in the new colony of New South Wales and was founded in 1862 - some 40 years before the federation of the Australian colonies into the Commonwealth of Australia on 1901. The Society's members over the decades have read like a 'who's who' of early pioneers in horticulture in Australia. The Governors of New South Wales (the representative of His or Her Majesty over the years) have been the Patron of the Society since 1862. This was pretty heady stuff for a couple of Louisiana iris hybridisers from Sydney, I can tell you, but we rose to the challenge and provided a delightful seedling for the task. A celebratory rose was also chosen for this special event. The colours of the Society are 'ruby and gold', so the name 'Bennelong Gold' was chosen for the golden-coloured rose and the name 'Bennelong Ruby' was chosen for the two-toned ruby Louisiana iris pressed into service for this special event. But why was the prefix 'Bennelong'used? 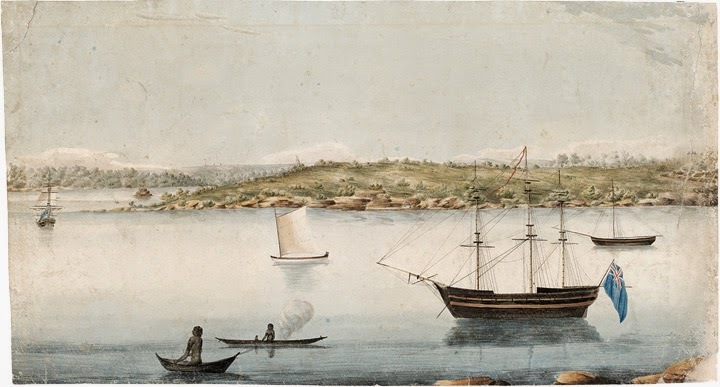 'Bennelong' was one of the first indigenous Australians to make meaningful contact with the first Governor, Governor Arthur Phillip, when the first European-based settlement was established in Sydney Cove in 1788. Governor Phillip was a bit of a linguist, having mastered many European-based languages before taking on the task of governing and co-ordinating the new settlement in what was then known as 'Terra Australis' or 'the great southern land'. Despite his linguistic talent, Phillip could not make much progress with the local Aboriginal dialect, but the young indigenous aboriginal, 'Bennelong,' was a natural at languages and he soon learned rudimentary English. He acted as a translator (both culturally and linguistically). His efforts were rewarded with a Governor providing 'Bennelong' with a small hut of wattle and daub construction on a small headland in Sydney Harbour, where he lived out his life in relative luxury. This headland is now known as Bennelong Point - and is the current site for the famous Sydney Opera House. The word 'Bennelong' therefore had great historical and cultural importance for Sydney, New South Wales and ultimately, the Commonwealth of Australia. Most tourists to Sydney either visit the Opera House or at least take a stroll around Bennelong Point during their visit. The combination of the name 'Bennelong' with the colours of The RHS of NSW Inc. (ruby and gold) seemed like a perfect fit for us. 'Bennelong Ruby' is a new release for Iris Haven this year, having been first made available via The Royal Horticultural Society of NSW Inc. in 2012. Rhizomes of 'Bennelong Ruby' are growing in the gardens of Government House, which itself sits just above Bennelong Point in Sydney. So, what's in a name? A powerful lot of interesting history, if nothing else! I started growing Pacifica Iris more than fifteen years ago, when the West Coast was in a warmer, drier weather cycle, so it took several years for my plants to experience even a little snow. In the past few years, a few snow days each winter have been more common than not, so I can now report knowledgeably on what happens to Pacificas in the snow. First, some species in my garden, including Iris hartwegii ssp. australis, I thompsonii and I. tenax, normally go completely dormant. In warmer snow-free years, they may or may not brown down until February. It's not uncommon for all of these species to keep green leaves for most of the winter, and then in early March, suddenly the old battered but still greenish leaves vanish, and a few weeks later the small, stubby new leaves appear. 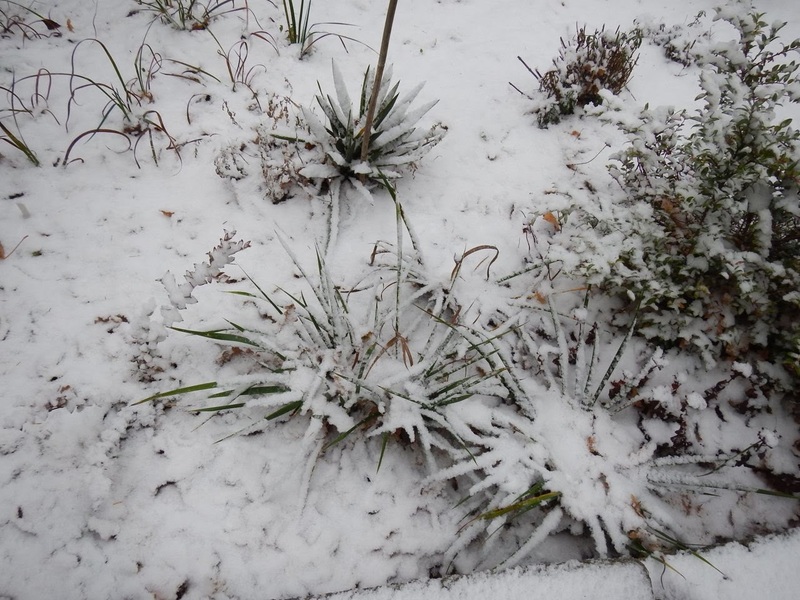 Now add snow to the mix, even just a few days, and wham, the leaves brown off, and the plants vanish from the surface. The second group, of species, includes Iris innominata, I. chrysophylla and I. douglasiana, and also hybrids, hangs on and keeps some green leaves all winter long, though those leaves can look pretty battered, and many are browning off, by late February. Hybrid Pacificas are a mix of many species, largely from around the Bay Area of the central California coast and nearby mountains. These tend to have more I. douglasiana genes, which is a sturdy evergreen species with large leaves. 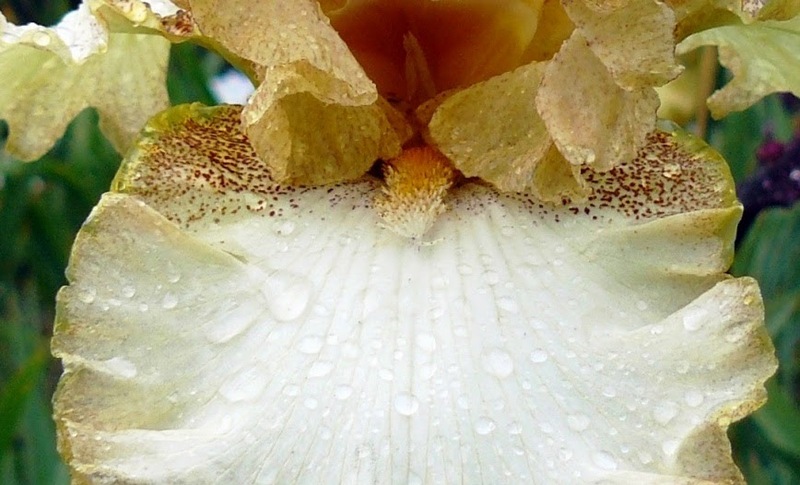 Iris 'Cape Ferrelo' under light snowfall. So the hybrids stay evergreen, come snow, hail, ice storms or torrential rains. 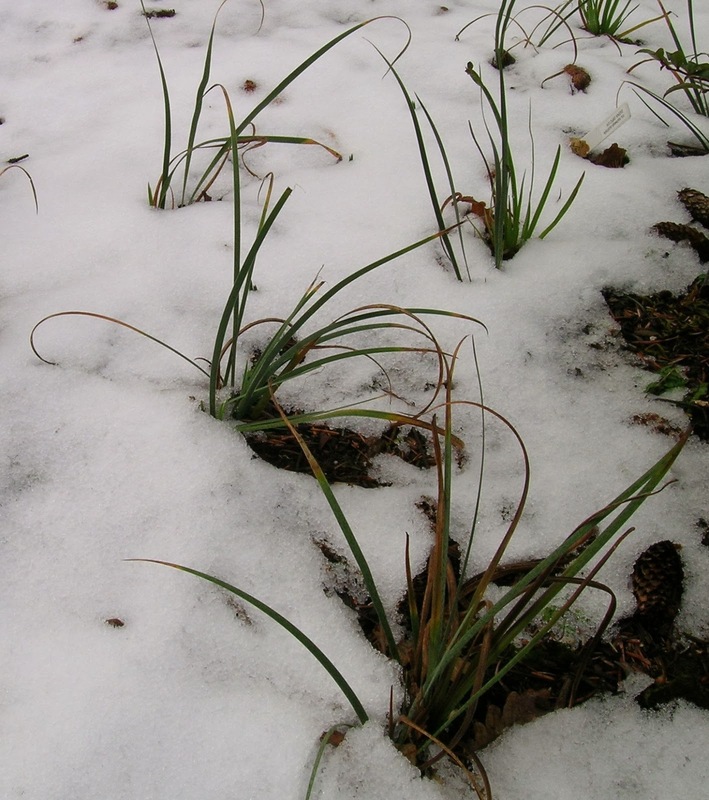 These traits, evergreen leaves or not, and a tendency to go fully dormant in snow or not, have helped me sort out the likely genetics of Pacificas that may come to a gardener without a label, or with an erroneous one. I. douglasiana and I. innomnata have durable evergreen leaves; I. douglasiana leaves tend to be thicker, longer, and wider, while I. innominata leaves tend to be a very dark green, narrower, and shorter. 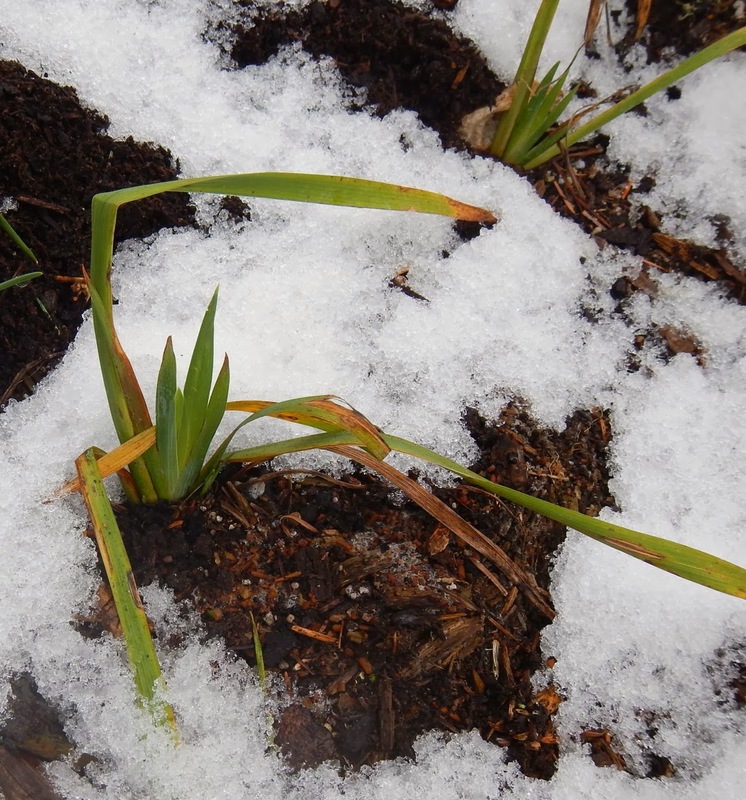 Seedling Pacifica Iris emerging from snow in the garden. My I. hartwegii ssp. australis plants were grown from seeds collected by a SPCNI member, Richard Richards, who lives in southern California. 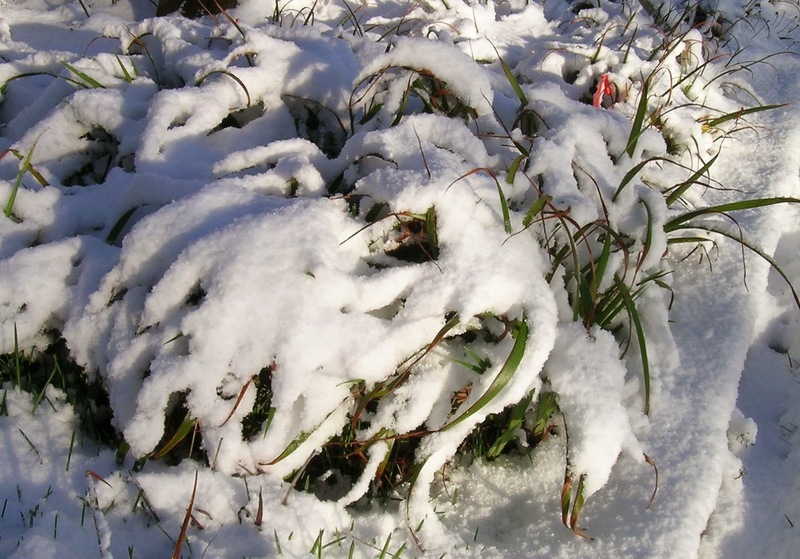 The first winter they experienced snow, I sent Richard a photo to show the plants well buried in white stuff. He wrote back that there was a drought that winter in the San Bernardino Mtns, and these plants might be the happiest individuals of that species anywhere on the West Coast that year. This was the first year that I noticed just how differently Pacificas go dormant under snow. Iris hartwegii ssp. australis emerging from snow cover. The last photo in this post is a Pacifica iris that was labeled I. innominata 'Burnt Sugar' when I bought it many years ago. The leaves are too wide and long to be solely I. innominata, which is the mostly likely species based on flower color. There's not a hint of dormancy when ice storms and snow arrive. This one has some I. douglasiana genes too. By the fairly narrow falls and standards, it is not too far from a yellow-flowered species selection, and is not a modern hybrid. ['Burnt Sugar' is not a registered name] Thanks to an industrious Steller Jay, the original tag, including source, is long gone. 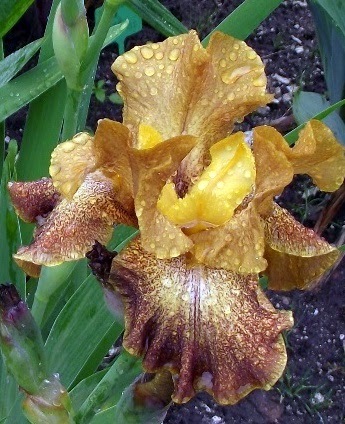 Iris 'Burnt Sugar', an unregistered selection, in full flower. Knowing now how Pacifica species behave in snow, it's clear that 'Burnt Sugar' has both I. douglasiana and I. innominata genes, hence the lovely yellow color with red veining on a sturdy plant with dark green leaves, and no sign of dying back under snow. 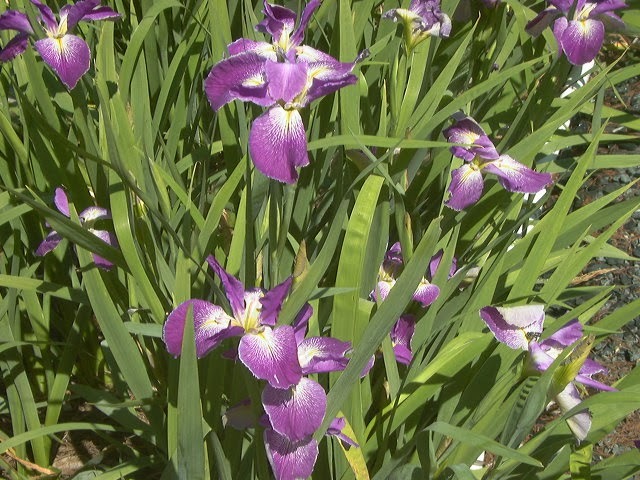 To learn more about these irises and others, visit SIGNA, the Species Iris Group of North America's website. 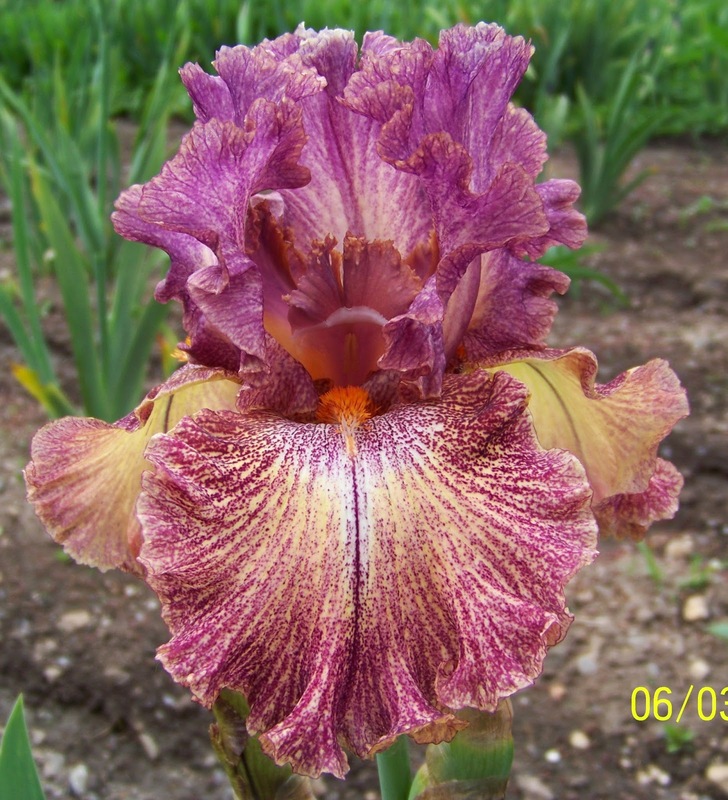 Polish iris expert and hybridizer, Robert Piatek, shares the process of his exciting, new plicata hybridizing program. Thank you, Robert, for sharing your passion with us! 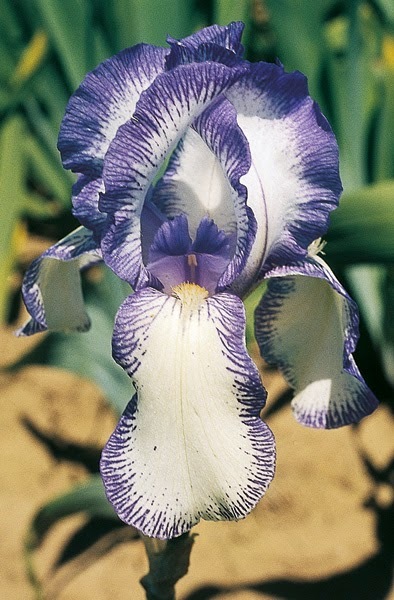 The plicata pattern displayed on bearded irises is spectacular and every grower aspires to create a plicata pattern that does not yet exist. The most distinguished grower of this group of irises is Keith Keppel. His work is unsurpassed. He is always one step ahead of his contemporaries. My strategy was never to grow just one group of iris. That is why my seedlings are diverse. But I digress. Back to plicatas! I immediately recognised the quality of this seedling and I registered it in 2010 in AIS as the QUEEN OF DEW. It is a flower of warm colours with standards like dark honey and perfectly white falls, with a pale plicata pattern of honey coloured freckles. The plant is robust but not too many shoots are produced each year. From this crossing I had a dozen or so seedlings but only three were plicatas. 'D' was not nice and I discarded it. The next two were okay, but 'A' grabbed my attention. The uprights are lavender with a light brown rim. The rim comprises of a number of brown lines that constitute the plicata pattern. The seedlings grow slowly but are quite prolific with 4 to 6 new shoots each year. 'A' from the SLOVAK PRINCE and BLACKBERRY THEASE cross. From this cross I like only ‘A’ with its unique shape of flower and dark burgundy colour. The plicata pattern is quite typical but on the uprights you can see a light brown rim. 'A' from 'KRAKOWIANKA' and 'WHISPERING SPIRITS' cross. ‘B’ has a well developed beautiful rich plicata pattern but the morphology of the plant is such that it will probably be discarded. 'B' from 'KRAKOWIANKA' and 'WHISPERING SPIRITS' cross. I continue to monitor ‘C’ and am still undecided in regard to whether it will be registered in the future. These are all my plicatas that I have created in the last four years but I still have 1,500 seedlings that are yet to flower. In pots I have 7,000 seeds resulting from many different crossings. I think in a year or two you could see my next plicatas. Maybe among them is something of a similar quality to 'QUEEN OF DEW'. 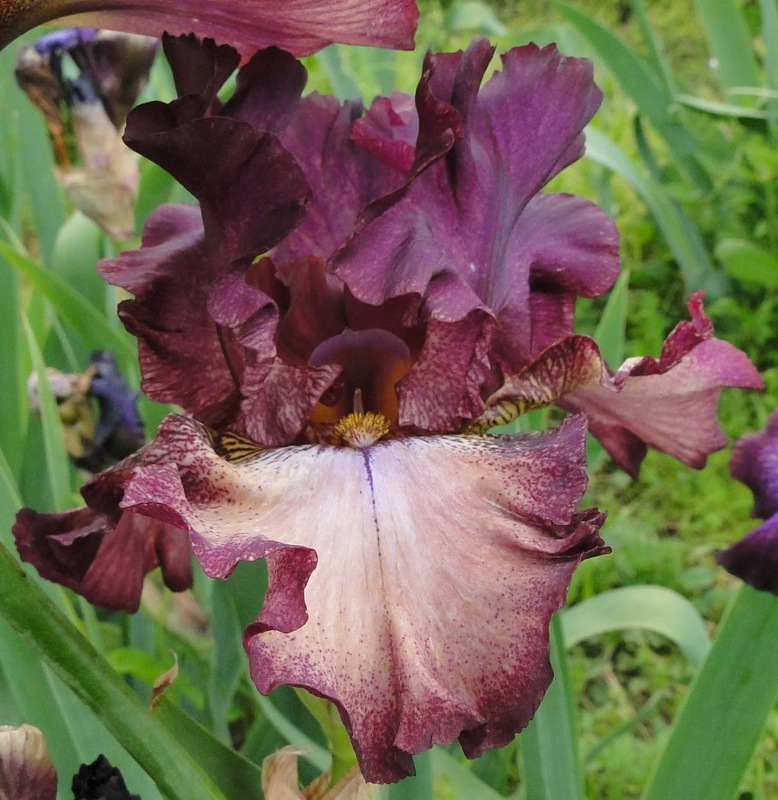 "Talking Irises" PLICATA TALL BEARDED IRISES--an historic past and an exciting future! 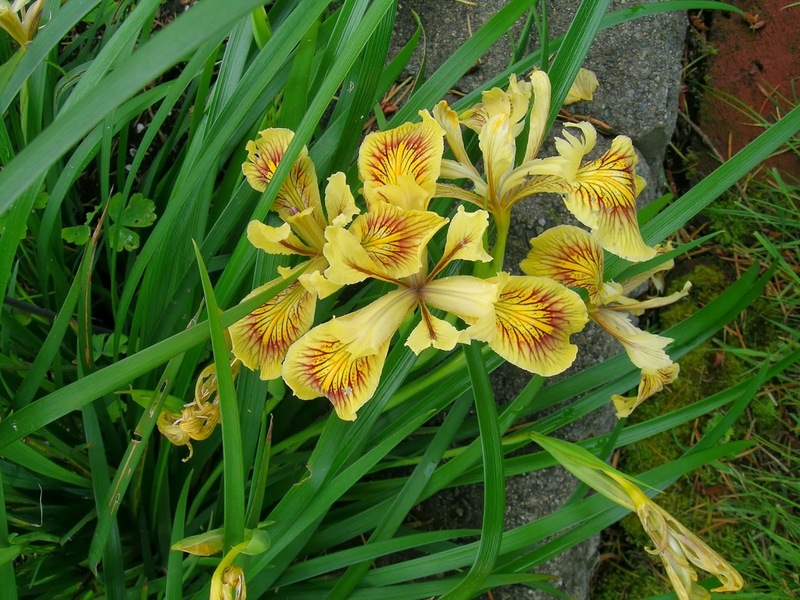 There are several forms of plicata irises. Walter Moores, hybridizer and iris expert, tells us there are those that are barely a plicata, with narrow margins; some are almost solid; some are banded; there are amoena plicata irises, others are bi-colored, others look like a seamstress has meticulously applied a hand-sewn edge; and still others look like a pepper shaker has applied the color, like his all-time favorite plicata, the heavily peppered 'Leanna.' I can see why it's a favorite! Plicata irises have been around forever. Shown here, the historic plicata from 1612, 'SWERTI.' It is still grown in the garden of Gordana Stojanovic, and is the oldest documented plicata. 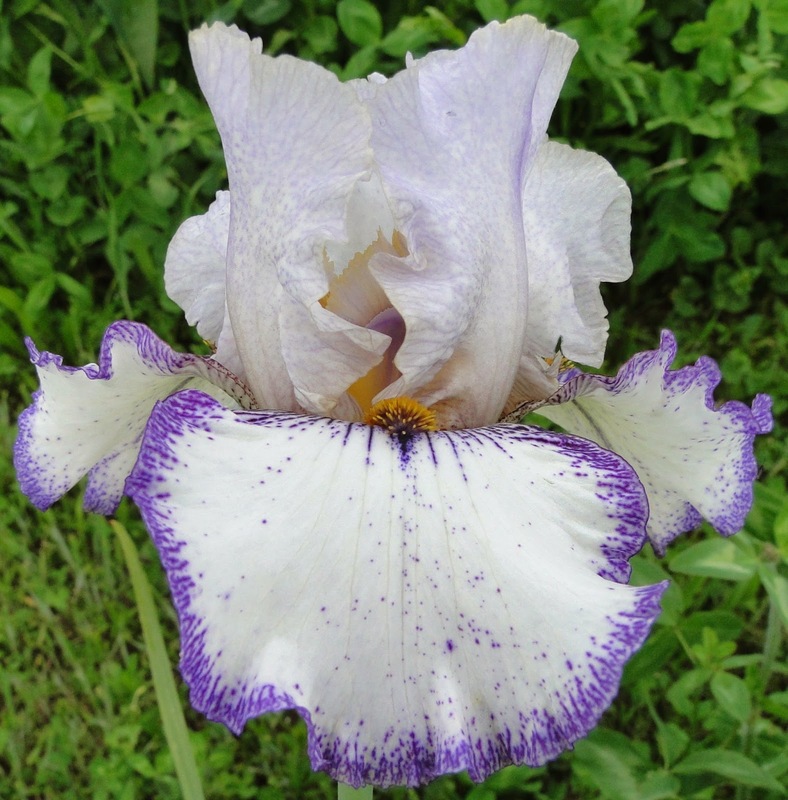 Considered one of the best bearded irises of all-time, the beautiful white and blue-violet plicata 'MADAME CHEREAU' (Lemon 1844) is grown all over the world, and is still offered by commercial iris gardens, as seen in this photo from Schreiner's Iris Gardens. 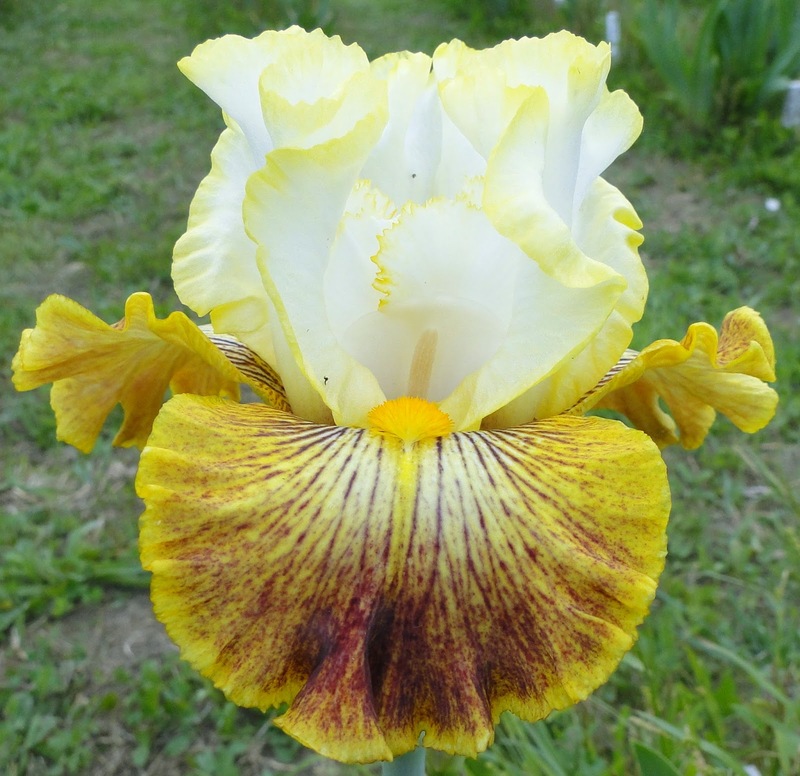 This iris is destined to be the front-runner of what Jim hopes will be a line of plicata irises with multi-colored standards. This is one of Paul's favorites in his hardy plicata program--WOW! As dramatic new plicata patterns are introduced in the coming years, one can only dream of the stunning creations yet to be introduced. I am anxiously waiting for many new beauties in the iris world. 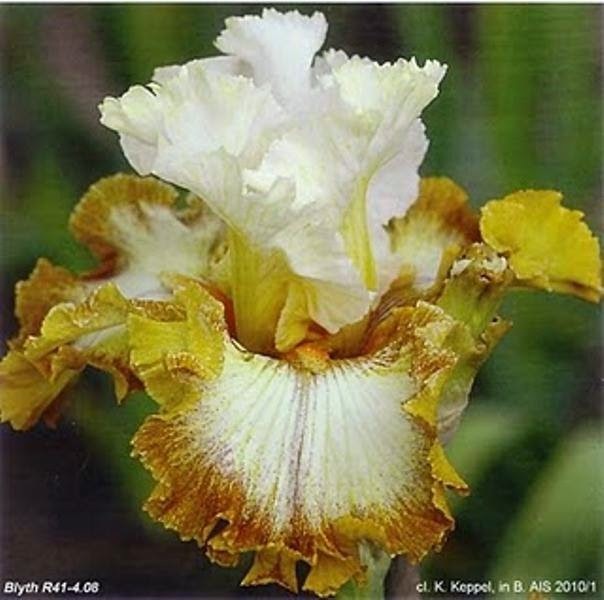 Watch for lots more Keith Keppel and Barry Blyth seedlings, shared by Roland Dejoux, in my next post! 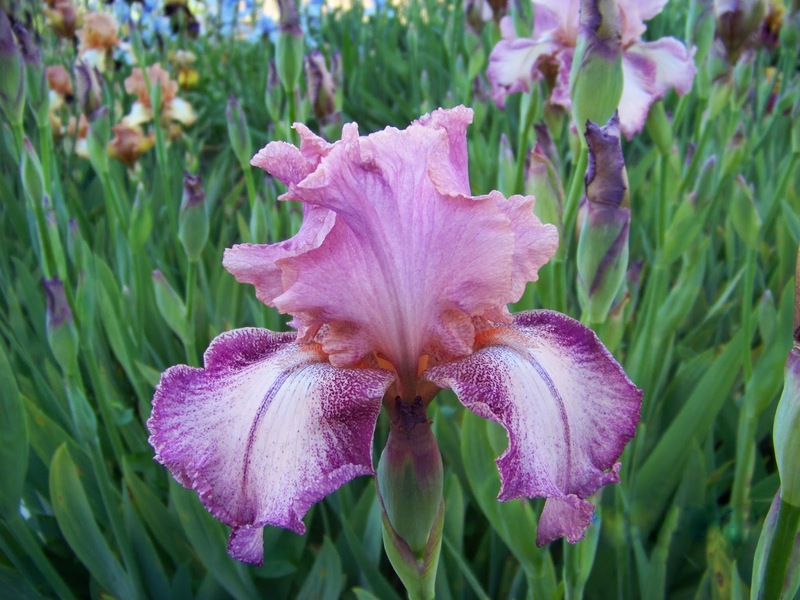 Do you grow plicata irises? What is your favorite plicata? I would love to hear from you! 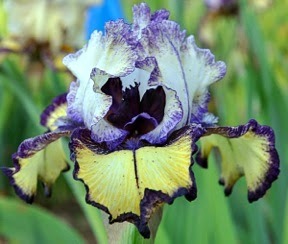 "The Amazing Plicatas of Jim Gibson"/Mike Unser, April 2, 2012, World of Irises. 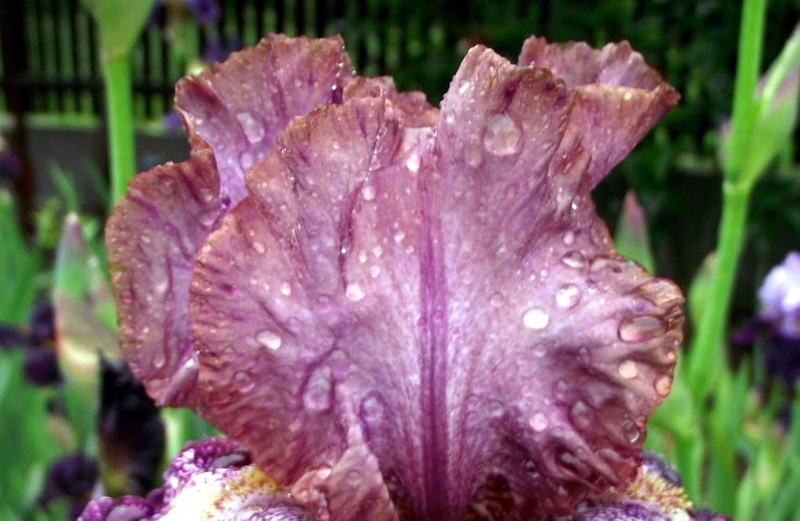 as featured in the April 2012 issue of IRISES, the Bulletin of the American Iris Society. "Plicata Tall Bearded Irises"/Jim Hedgecock, January 17, 2012, World of Irises.